‘Operation Global Blackout’ is planned because Anonymous wants the ‘People of the World’ to know that the delay of SOPA and PIPA doesn’t guarantee that our Internet rights will be upheld. There is a proposed plurilateral agreement called the Anti-Counterfeiting Trade Agreement that still poses a threat. Anonymous goes on to rally support for their cause by asking, “Would you like to become a part of the greatest Internet protest and first official cyberwar?” The video aims at recruiting those who share the ‘Anonymous Consciousness’ and wish to participate in the assault. Instructions are given for those joining Operation Global Blackout on how the attack is to be conducted. The theory is that if everyone launches the attack at the same exact time, then Facebook’s servers can be crashed. The voice of Anonymous tries to convince the masses that there is no way you can be caught because the sheer volume of participants will make it impossible for authorities to prosecute, so would be crusaders proceed at your own risk! A similar story circulated in August of last year whereby Anonymous claimed they were going to attack Facebook on November 5. Anonymous quickly disavowed any association with this particular message, and no attack was forthcoming. According to C Net blogger, Chris Matyszczyk, the YouTube account used to post this video does have ties to Anonymous. Do you think bringing down Facebook will help or hurt Anonymous’ cause? 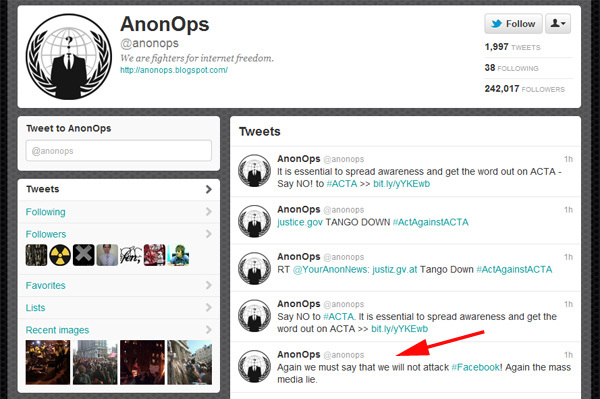 Anonymous has stated via their Twitter account that the plans for an attack is a lie.